I know what you might be thinking: pear season is over and she's posting a recipe with pears now? The timing is a little off but I still hope those who are keen to try the recipe will find a way to buy fresh pears, bookmark this recipe to try later or just go ahead and use canned pears. But you will understand why I'm sharing this right now with you. The timing is not so unfortunate after all. I have this friend, Natasa, who loves to bake. What she loves even more are the tastes of the Balkans - particularly the specialties of Croatia, where's she's from originally. One day when she realized that, while it was fun to bake for friends and family, she wanted also other people to discover the taste of her homeland. 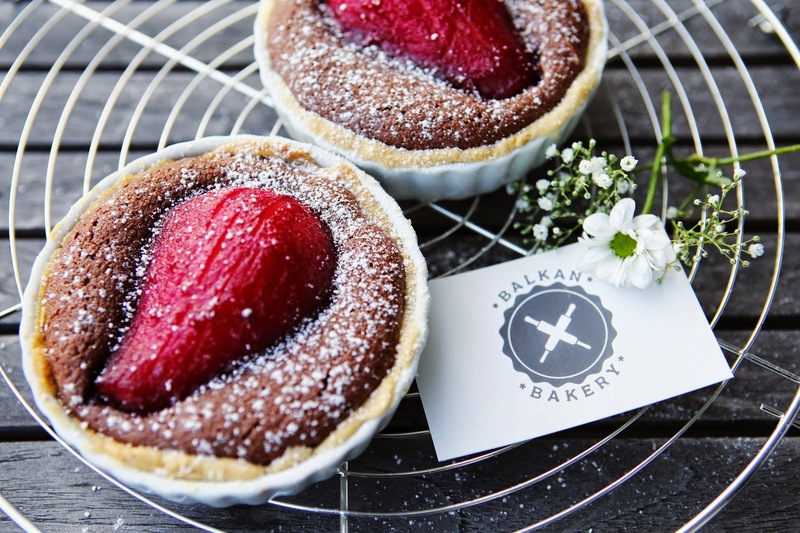 That's why she started the Balkan Bakery together with the help of her mom. A couple of times a year she has a bakery display at food festivals and other fairs where you can eat yummy Ruske Kape, Cupavce and so on. Sounds yummy? Then make sure to head to the Bazar im Stall 6 next Saturday May 16th where she'll have a stand. And you probably might bump into me as well! I told you, perfect timing after all! 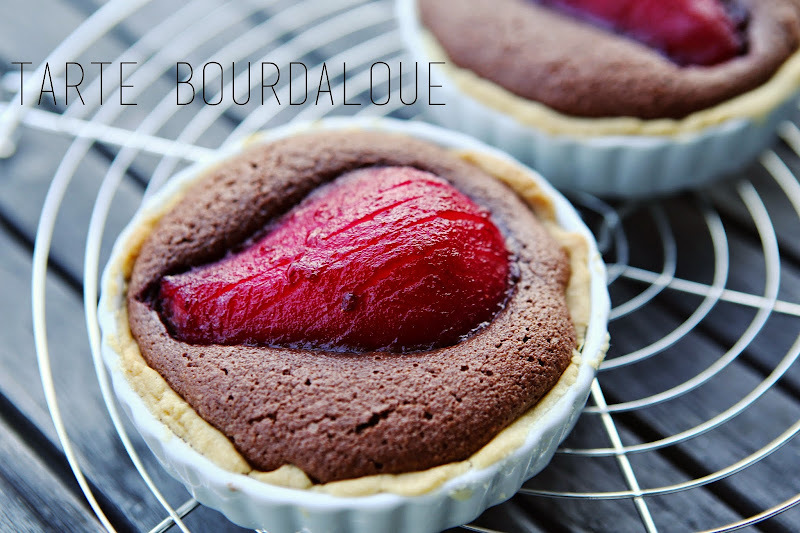 But let's talk about these little Tartes Bourdaloue on the pictures. 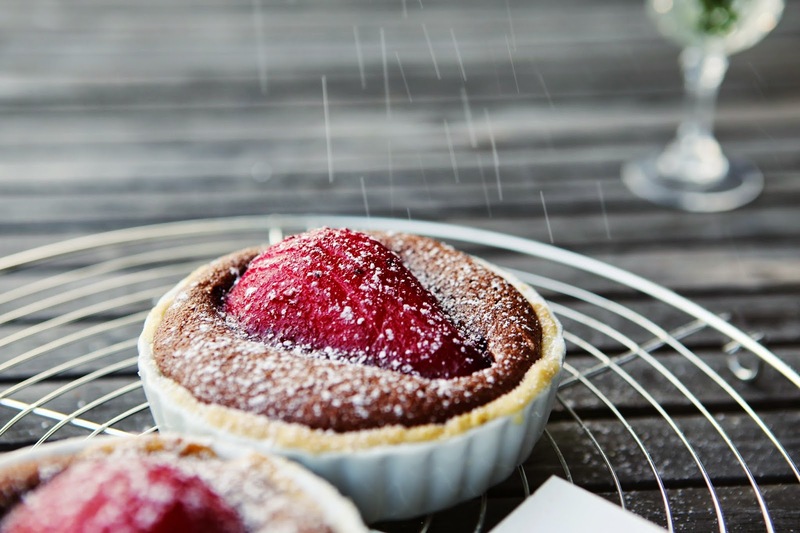 A couple of months back I found myself in the kitchen with Natasa and we wanted to bake a classic French dessert neither of us had attempted before. It was so yummy and actually not that difficult to make, so I hope you enjoy this as well. We made adjustments to the classic recipe, which you can find here along with photos that might be helpful. If you don’t use canned pears, let’s start with peeling the fresh ones. Put the water, sugar and vanilla pod in a saucepan over low heat. If you’d like to color your pears like we did, add a cup of frozen red berries. When the sugar is melted, but the syrup doesn’t boil yet, add the peeled pears (still whole!) Then drizzle the juice of half a lemon. Place over medium heat with a lid and cook for 30-40 minutes, depending on the size of the pears. When the pears are soft, let them drain and set aside for the rest of the recipe. Next we’re going to make the dough. Place all ingredients except the egg in a bowl or in a food processor and mix until the butter is incorporated. Add at this point the previously beaten egg, mix again just a little so the egg is incorporated as well. Put the dough between two parchment papers and roll it to a thickness of about 2-3 mm. This way you don’t need to flour your work plan. Now you can decide if you want to use a regular tart tin (about 22 diameter) or like we did four little dishes. Line whichever you choose with parchment paper and place your dough on top. Cut the excess dough with a knife and press well the sides of the tin. Finally it’s time for the delicious almond filling. Just place everything in a bowl and mix well. You could add some rum if you want to. Heat the oven to 180 ° C. First we’re going to blind-bake the pastry (as described here) for 15 minutes. Then pour the almond filling, place your pears (we cut them length-wise) and return to the oven for another 30 minutes. Remove, unmold carefully and let cool on a cake rack. This looks delicious! Yummy eats!